And this is the first step, all cut! I'm pleased. There's a link back to her and David's first quilt, Star Blossom, in the purple fabric. I had just enough. The green is left over from Cheryl's Meadow Mystery (which hasn't grown into a flimsy yet, just at the 'blocks all done' stage), the pink is Craftsy's Boundless Blenders Botanical (affiliate link - just gorgeous fabric, in colour and hand), and the small floral background is Windham Fabrics 'Enchanted' by Sarah Fielke. So I am now officially up to date. I even sewed the cut-off triangles together and will work them into the backing or something else if there are more in my future. 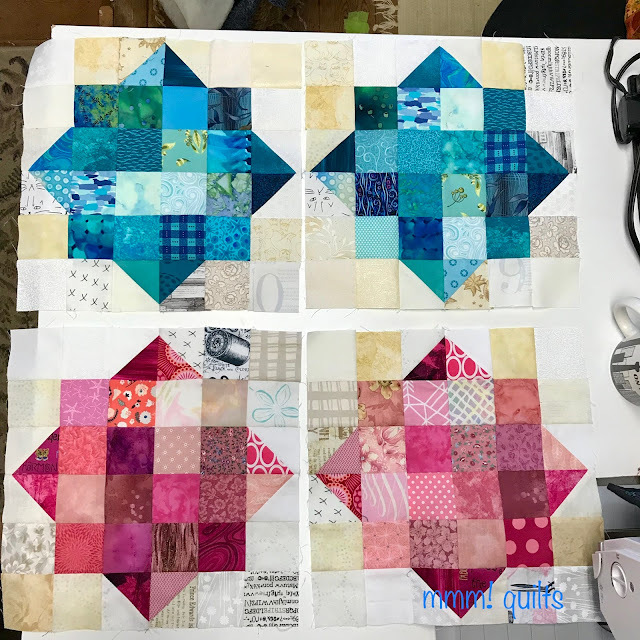 I'm always surprised at how much time these consume, especially if I don't have a lot of pre-cut 2.5" squares (I didn't of turquoise/teal) and I'd also completely run out of the low volume background ones, as this block eats up 12 of them per block! 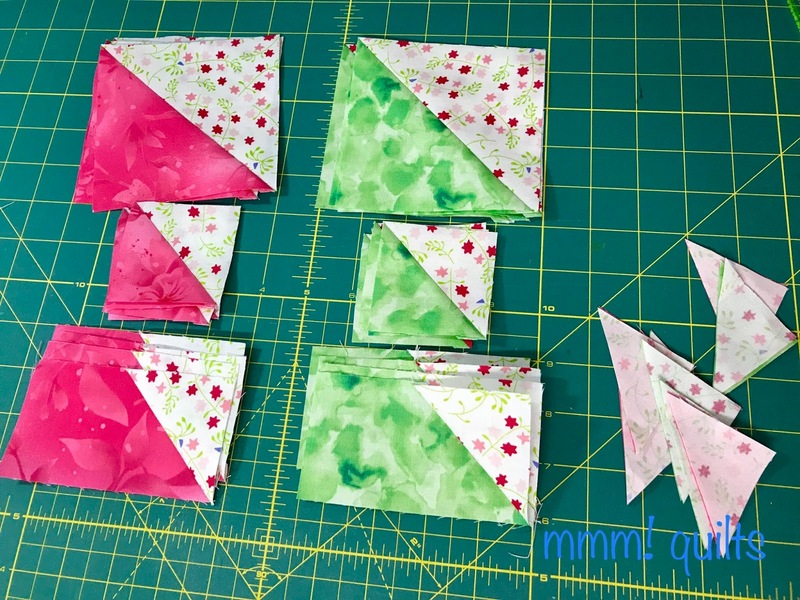 I also have to cut 3" squares for the HSTs, but this time around, I cut extra so I should be ready to sew for July's colour. It still never ceases to amaze me that no matter how many of these RSC quilts I make, my scraps barely get a dent in, and I see the same fabrics in what, now six, I think, of these RSC quilts. 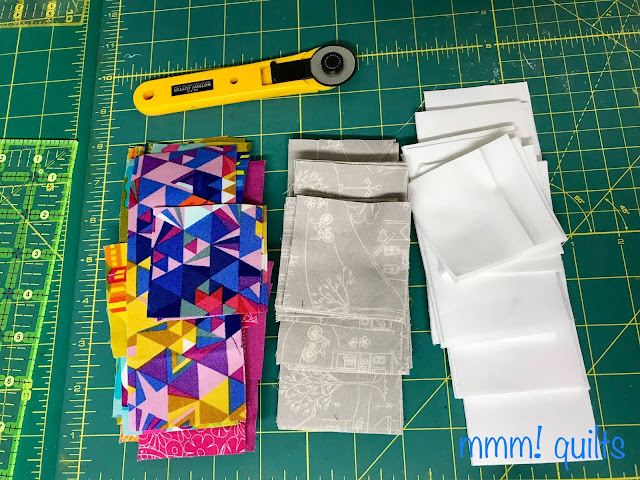 These are leftovers, a few 1.5" strips, from the original Plus Playtime quilt as featured in Benartex's Modern by the Yard January issue, and which is the current QAL here on the blog (see Quilt Alongs tab up top). The flimsy link-up opens tomorrow btw, and there's another draw, for a $25 gift card to Stitch Stash Diva, so get those flimsies together! 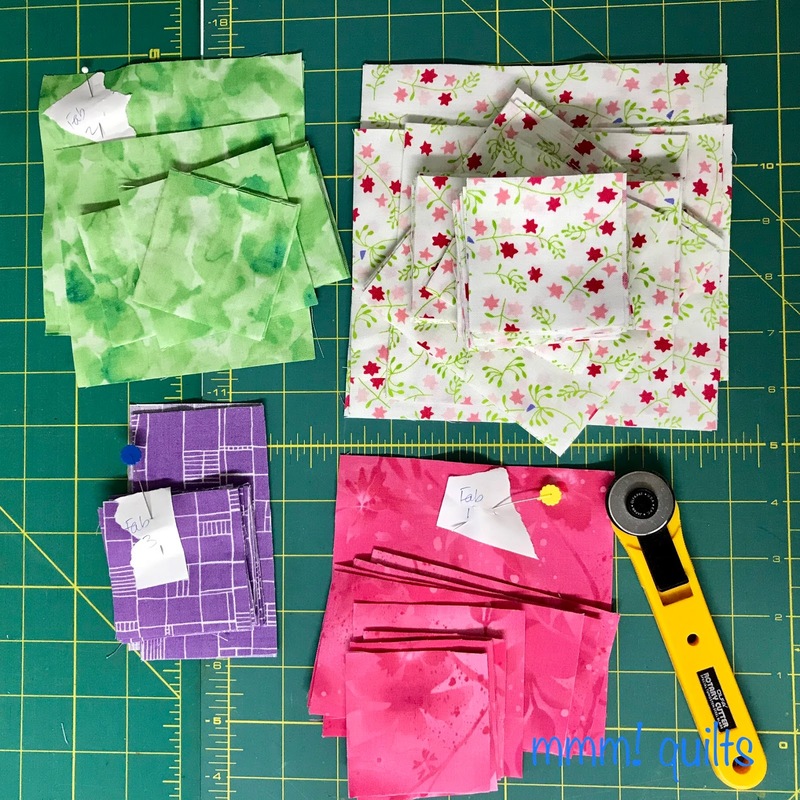 The dot fabrics are almost gone, shared with a couple of bloggy good friends, and a bit kept back for the second H2H quilt for Confessions of a Fabric Addict (which is also a UFO, red face of shame). So nice of Sarah to send everyone a prize: this year I received a small soft pressing mat, great to take to a retreat or class. Thank you Sarah, always a great cause to sew for, and I can't wait to finish my second one and deliver both of my quilts. All cut there, the small plus blocks from Alison Glass fabrics which are in the kit (no longe available in these but the Architextures/Glean kit is). You'll have to pop by tomorrow to see the flimsy...you can see the first three blocks on Instagram; I'm @mmmquilts. The grey is by Red Rooster Fabrics, 'Around Town' by Terri Degenkolb for Whimsicals given to me by Julie of Pink Doxies, and I used every last bit of it but for a not-quite WOF by 2.5" strip! The white is left over from a quilt for an upcoming magazine, Modern Patchwork, (super excited) a white solid from Paintbrush Studio. May I say how much I love their solids after working with them a couple of months back? They've come a long way, baby. Hope you had a productive weekend whatever you chose to do! Besides sewing, I got to spend time with good friends, Lake Erie in my appreciative eyesight, and then that evening with our daughter Dayna and fiancé Tyler in Greektown, Detroit. Busy weekend! You definitely got a lot done. I LOVE your background fabric for Tish's mystery! It's so perfect with the other fabrics. I also love those blocks you're making for the RSC. I keep meaning to try making one myself, just for fun! All of your projects are looking so cheerful! There's no such thing as "falling behind" in quilting -- that's something that only happens IRL. :-) I like the idea of intentionally "going dark" from social media to get your equilibrium back. I call those my Mental Health days. So, what's a Cat Mat? Can you actually train a cat to go to its mat and STAY there?! That's not my understanding of how cat/human relationships work... Hah! Those fireburst fabrics are wonderful, and the smaller triangles, I have saved mine too. You have a lot on the go, but a choice is always good when the day begins. A great weekend and so much progress. I am limping along with my new blog - but some things like bloglovin haven’t picked it up yet, so I am waiting to post much - well and learning some of the ropes. Plus quilt flimsy finish tonight - I hope. 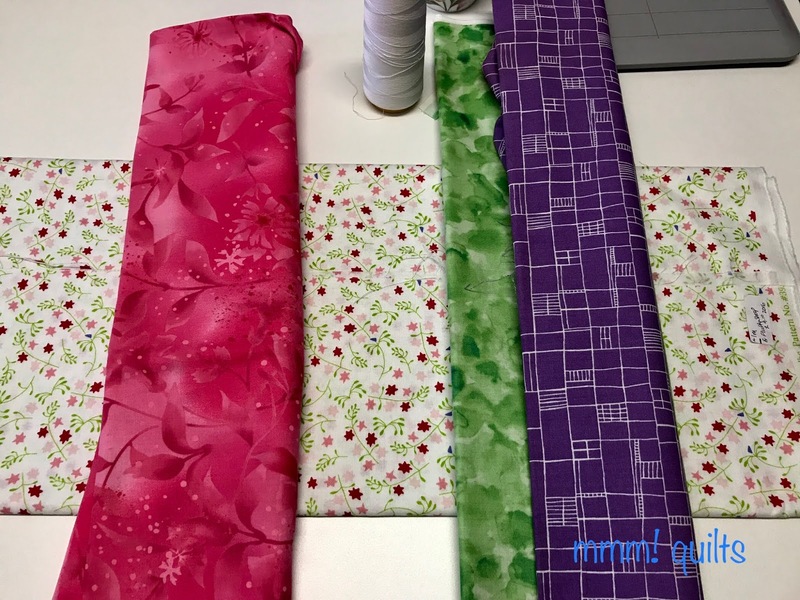 I LOVE LOVE LOVE the fabrics you are using for Fireburst! I can't wait till we see the purple sewed in with the other fabrics :) I'm always amazed at the colors you have within your scraps, it makes for an amazing rainbow of colors in these quilts. Cat mats....have them been cat approved yet? Where is our official tester? I'm loving all the colour on in this post. The cat mat is to die for and I love the block you are using for the scrap challenge. It looks wonderful. It sounds like a good week. I am glad I wasn't the only one taking my sweet time pulling fabrics for Tish's QAL. You did indeed have a good weekend, me too lots done. Lookin real good. You did good girl. Love the fabric choices for the Fireburst Mystery. Good to use up some leftovers from other projects. I'm going to have to make a RSC quilts, so simple, so beautiful. Very productive weekend. Beautiful bright colors for all of your projects. I love scraps because I get to keep using my favorite fabrics....hate it when they are all gone. Look forward to seeing your July blocks mixed in the RSC blocks. I admire your stick-to-itiveness. Isn’t it amazing how much you can get done when you go dark for awhile? (Not that I’m advocating that long-term) So many colorful bits in this post. I find it baffling, too, why the RSC doesn’t use up more. I had visions of reducing the scraps to nothing this year. Ha! Oh well, it just lets you go down memory lane over and over. Oh, your Fireburst fabrics are very pretty! You've had a very productive weekend and it's fun to see what you've gotten done! The fabrics for that Plus Playtime -- wow! 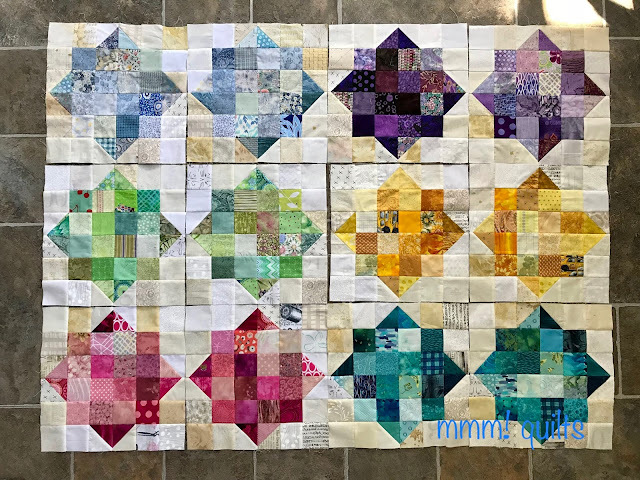 Lots of Quilty goodness! 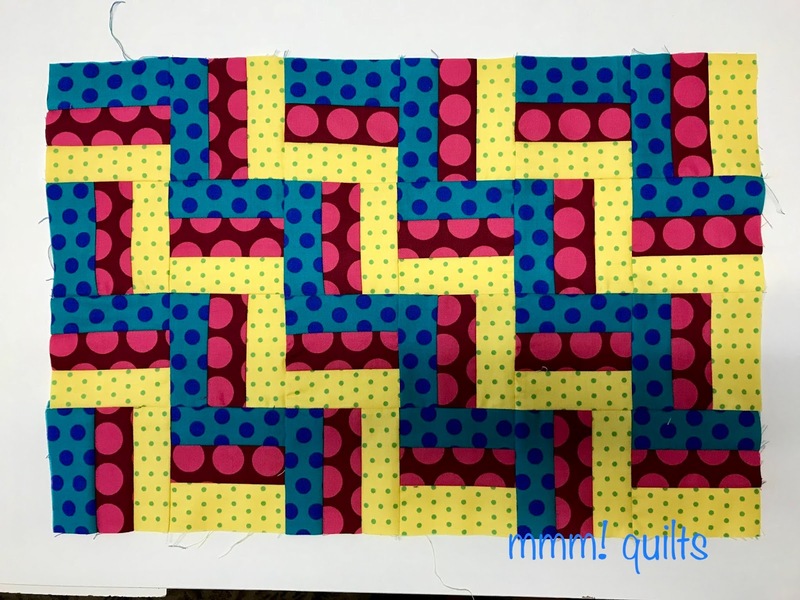 Can’t wait to see how your Fireburst quilt works up! I saw your IG yoga posts and wanted to say that they really made something click for me. I've restarted my daily practice, hooray! I'd stopped because the boat was moving so much that I couldn't keep my balance on many of the poses, but Sun Salutations are so much more stable. So thank you thank you! Beautiful fabrics for all of your projects! I didn't get past the pick the fabrics out stage for Tish's QAL. I think I need a dark week so I can get something done. Wow! You made a lot of progress. Love all you scrappy projects! I'm sure they are out there, but I've yet to meet a rainbow scrap project that I didn't like. You sure did have a productive weekend! Everything is looking for beautiful :) I'm pretty sure scraps multiply when we're not looking. You've had a really busy weekend, and keeping up to date with all the projects in hand is really tough. I wish I could be more organized! **Visiting from @Zarkadia, Denim quilt. I so loved your fabrics that I had to join in today! My colors are selected and shall start cutting and piecing tomorrow. I guess one cannot have too many projects started? LOL for sure! Wow, you've been a busy gal. Love your fabric choices for the Fireworks mystery. I love your fabric choices for Fireburst. Can't wait to see it pieced together.